Asia-Pacific has been the fastest growing region over the past 10 years. It has also risen over the past year, despite scores declining in seven of 24 countries. All pillars have had a score increase in the past decade, with the exception of Safety & Security, which has remained level. Many of the middle and lower ranking countries are improving prosperity levels at a higher rate than those at the top of the rankings. This year, the best improvers were India, Bangladesh and Hong Kong. 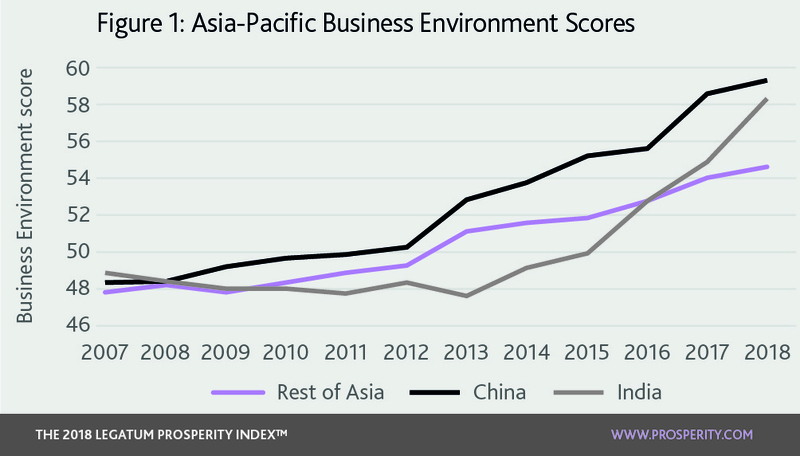 Asia-Pacific is the third highest scoring region for Business Environment, with a significant increase in score over the past decade. This trend continued last year with rising scores in the access to credit and investor protection sub-pillars. Asia is no longer last in the Natural Environment pillar and has overtaken Sub-Saharan Africa, in large part due to improvements in their wastewater treatment facilities. Personal Freedom in the region is still low, but has increased slightly in each of the past three years, mostly due to greater social tolerance. However, basic legal rights in the region have declined in the same period. India now ranks 94th, and its prosperity score has risen the most in the past year, with all pillars except Social Capital improving. Governance is its highest ranking pillar and last year saw an increase in citizens’ confidence in government. Other improvements include continued reductions in absolute poverty and an enhanced entrepreneurial environment, with easier access to credit, which improved the Business Environment rank by 11 places to 51st. 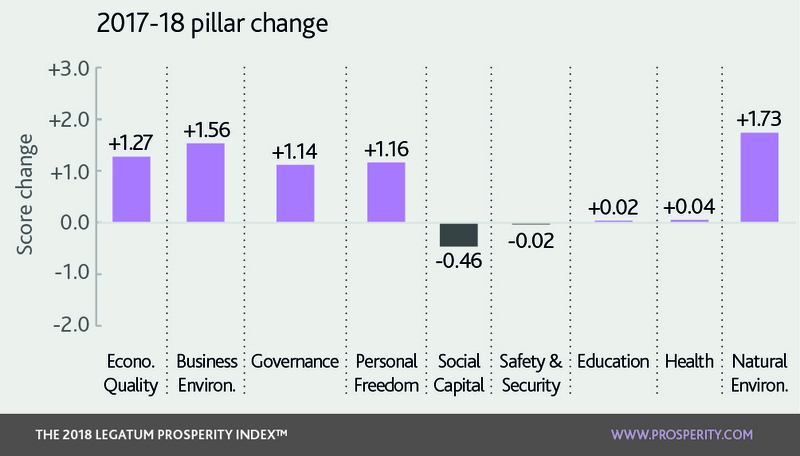 Cambodia’s Governance score fell due to a reduction in their democracy level. They are ranked 100th overall and 130th for this pillar – they have now slipped behind China and are only ahead of Afghanistan for this pillar in Asia-Pacific. Their leader, Hun Sen, has now been in power for 33 years and has effectively instigated a one-party state. Laos fell in the Social Capital pillar. Personal Freedom also fell in the country, with less tolerance towards immigrants and less satisfaction with the level of freedom. Deaths from terrorism over a five-year period have decreased in Pakistan, which ranks 136th in the Index. This, combined with the continuing trend of improved living standards in the country has contributed to it having the third largest regional increase in prosperity over the past year. Afghanistan is now last in the world rankings, after falling more than any other country. It fell most in Social Capital and Safety and Security. It ranks in the bottom 10 for six pillars and is no higher than 130th for any pillar. 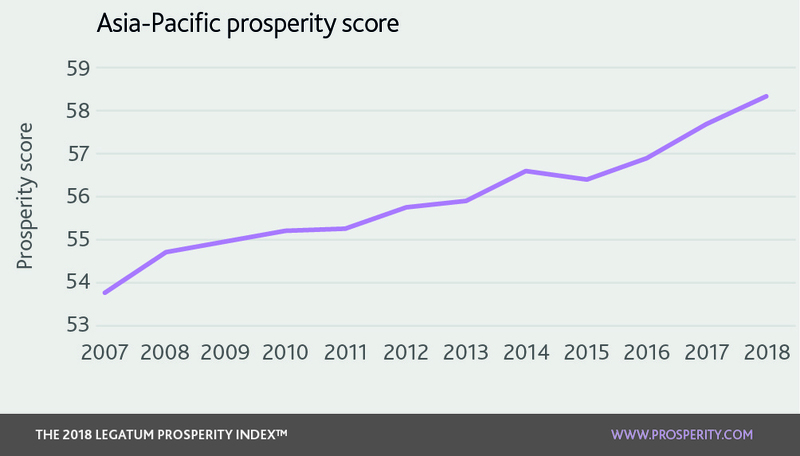 Asia-Pacific has risen more than any other region since the Prosperity Index began, and is home to some of the world’s biggest economic success stories. Although it is the fifth ranking region overall, it comes third in Economic Quality, Business Environment and Governance. As noted in the Latin American feature, these pillars are essential for the foundations of economic wellbeing. Two countries in the region exemplify this enormous increase in economic wellbeing. In the last decade, China and India have lifted large numbers of people out of absolute poverty, have economies that are growing much faster than those in the West and have moved 11 and six places respectively since 2007. Both countries, and the region more generally, are home to a growing middle class, who increasingly expect a higher standard of living, from the basics such as running water and electricity, to internet access and motor cars. However, there are significant differences in the way that they govern and the levels of freedom enjoyed by the citizens of these countries. China, ranked 82nd this year, has reduced the percentage of people living in absolute poverty from 66% in 1990 to 1.4% in 2018. China’s recent economic success is a well-told story, with predictions about China over-taking the US as the world’s largest economy scattered across headlines. 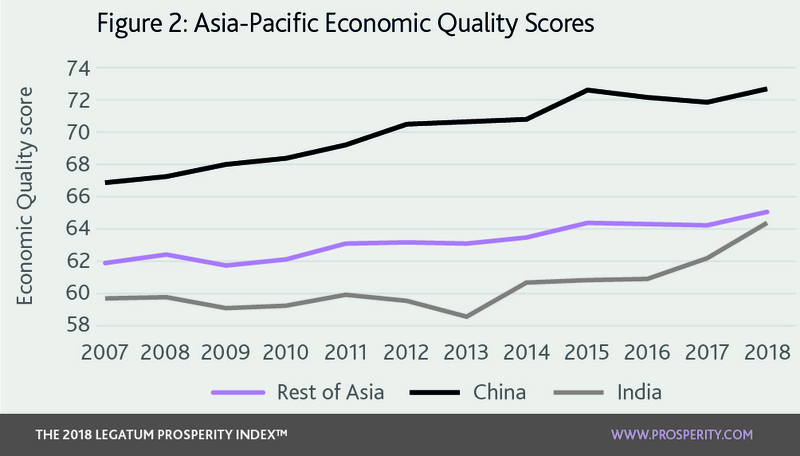 There is good justification for these predictions; China is 27th in the world for Economic Quality, with increased economic complexity and good anti-monopoly scores. Since the 1980s, China has increasingly opened up to the world, joining the World Trade Organisation in 2001 and further integrating into the world economy, although not without a few hurdles along the way. The country’s Business Environment has also been improving, currently at 43rd in the Index. The country still scores poorly on ease of starting a business (75th), but is ahead of Japan (85th) on this indicator and is improving. China currently makes up one of the biggest pools of unlisted companies with billion-dollar valuations, with 64 start-ups collectively valued at $227 billion.1 It also performs well on measures of business infrastructure, scoring 25th for the Logistic Performance Index and 41st for broadband subscriptions. Although China scores well in measures of government competence, it will come as no surprise that political participation and Personal Freedom score poorly. This is a problem that the Communist Party of China (CPC) will eventually have to confront. As the country’s middle class increases, thanks to more economic freedom, it is possible that they could begin to demand more political and personal freedoms, neither of which the CPC is in a hurry to relinquish. India has also seen phenomenal change in the past decade, experiencing the sixth best economic growth per capita in the past five years and has moved from 100th to 94th for overall prosperity in the last 10 years. Like China, India too has a growing middle class and the Modi administration is determined to pull its remaining citizens out of poverty, with initiatives involving attempts to encourage poor households to open bank accounts, increasing internet connectivity, and, most recently, ‘Modicare’, a policy aimed at providing 500 million of the poorest Indians with healthcare. This approach will of course have to be coupled with improving its Economic Quality and Business Environment pillars; it is still some way behind China in both these measures. India also scores very poorly on the ease of starting a business, coming in at 126th. In contrast to China, India scores high in the Governance pillar, ranking at 40th in the world. As the world’s largest democracy, India is very strong on measures of political participation, rule of law and government integrity. Yet the country is not without its problems; its treatment of women and minority rights is frequently called into question, with a growing educated middle class increasing scrutiny of these matters. The introduction of the Citizenship Amendment Bill is the most recent example of this, which will grant citizenship on the basis of religion but excludes provisions for Muslims. Some of these strengths and weaknesses are evident across other Asia-Pacific countries. Countries such as Malaysia and Indonesia are experiencing enormous growth, in part due to strong performance in Business Environment and Economic Quality. However, while the region has seen the best economic growth over the last five years, as we noted in last year’s report, Personal Freedom in the region is poor. This might, in part, be due to a desire to maintain political stability so that economic growth can be sustained. Singapore is an example of a country that has done this successfully – it is ranked 98th for Personal Freedom but 21st for prosperity. The challenge faced by China’s rulers are faced by others across the region; as people become wealthier it is likely they will ask for more political freedoms and influence.